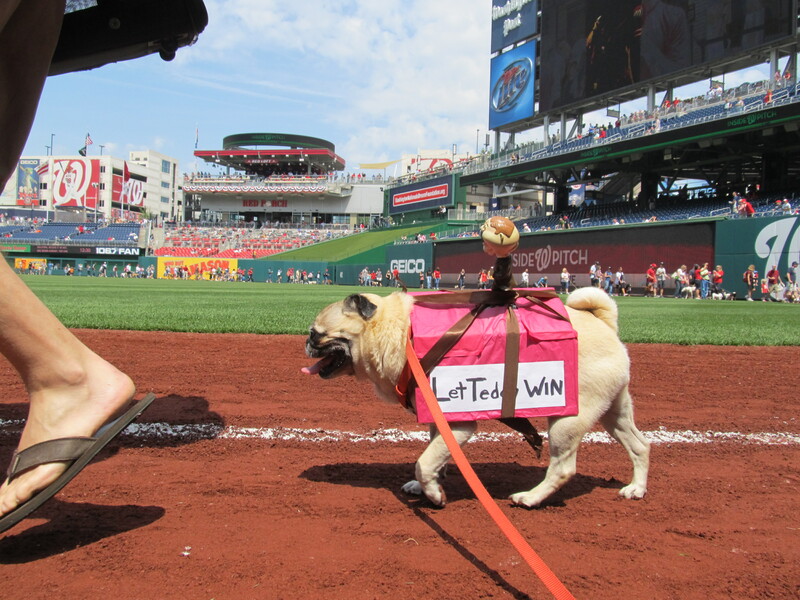 Pups in the Park | Let Teddy Win! 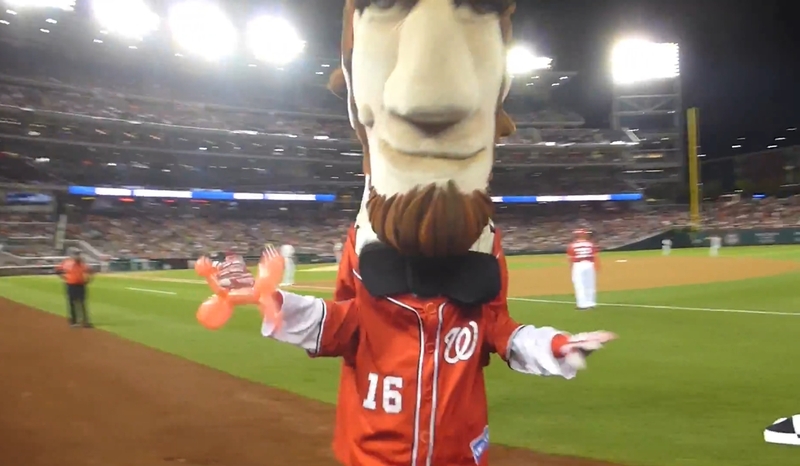 “Honest” Abe Lincoln closed out the 2015 home season Monday with an emphatic wire-to-wire victory at Nationals Park, sealing the Great Emancipator’s record fifth presidents race season title. It was only Lincoln’s fourth victory since August 9th, but that was more than enough to hold off the increasingly crowded field. Five presidents had remained in contention heading into the final homestand, and four of them won, allowing Abe to back into the championship before the weekend. A tribute to the Rugby world cup on Tuesday had the founding fathers carrying a rugby ball downfield, but a fumbled pass and a bit of fan interference put the ball in Teddy’s hands. Teddy stiff-armed Abe and carried it over for the win. Thursday night marked the return of Rebecca Raccoon, Calvin Coolidge’s famous pet, who made her first appearance back in August. The nocturnal pest reprised her role as interloper, pouncing on Abe Lincoln and causing a pile-up in the home stretch before escorting her owner across the finish line. 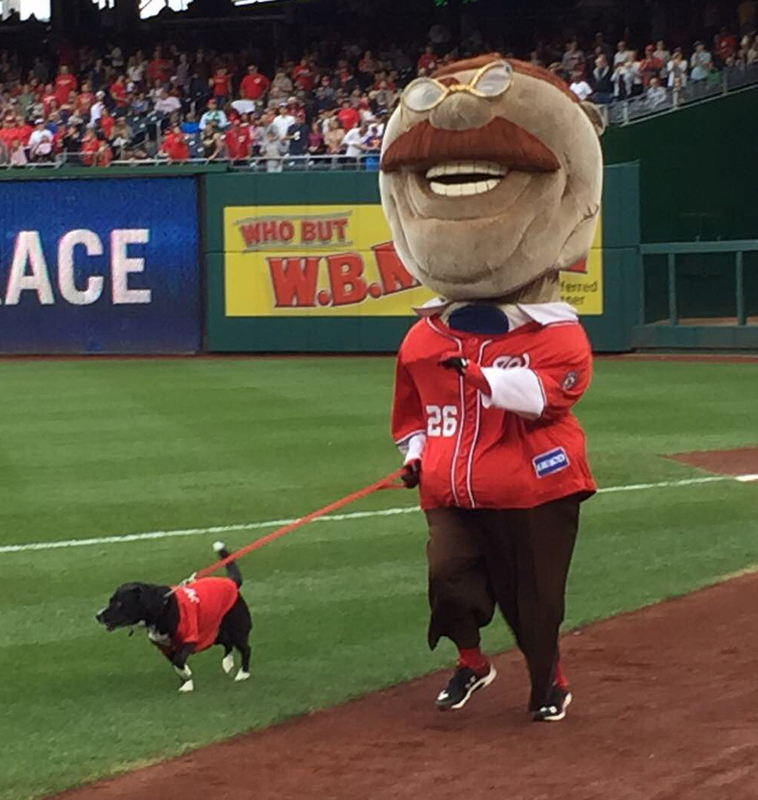 Saturday was Pups in the Park day at Nationals Park, and Teddy Roosevelt used the occasion to introduce his own pet dog Teddy to the field. Wearing a “Teddy 01” dog jersey, Teddy accompanied the Rough Rider as he followed the racing presidents onto the field, then lapped them to take the win and finish third in the season standings. 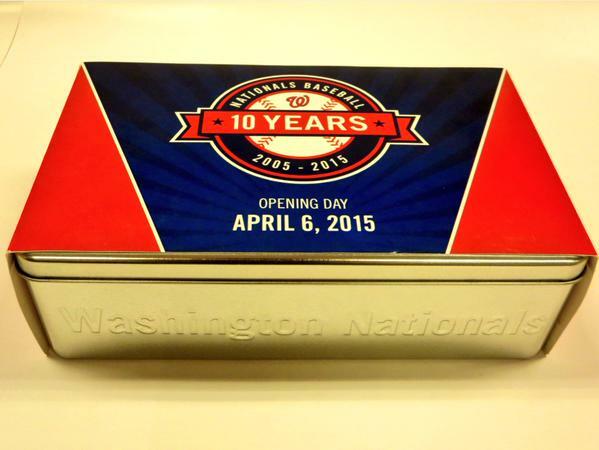 And with that, the tenth presidents race season comes to a close, a little earlier than most Nats fans expected. The Washington Nationals have tripled the number of bobbleheads given away this year as part of their 2014 game day promotion/giveaway schedule (full schedule below). The schedule includes a whopping seven bobblehead nights, with quantities jumping from 15,000 per game to 25,000 per game, for a total of 175,000 bobbleheads, vs. just 60,000 in the previous several seasons. 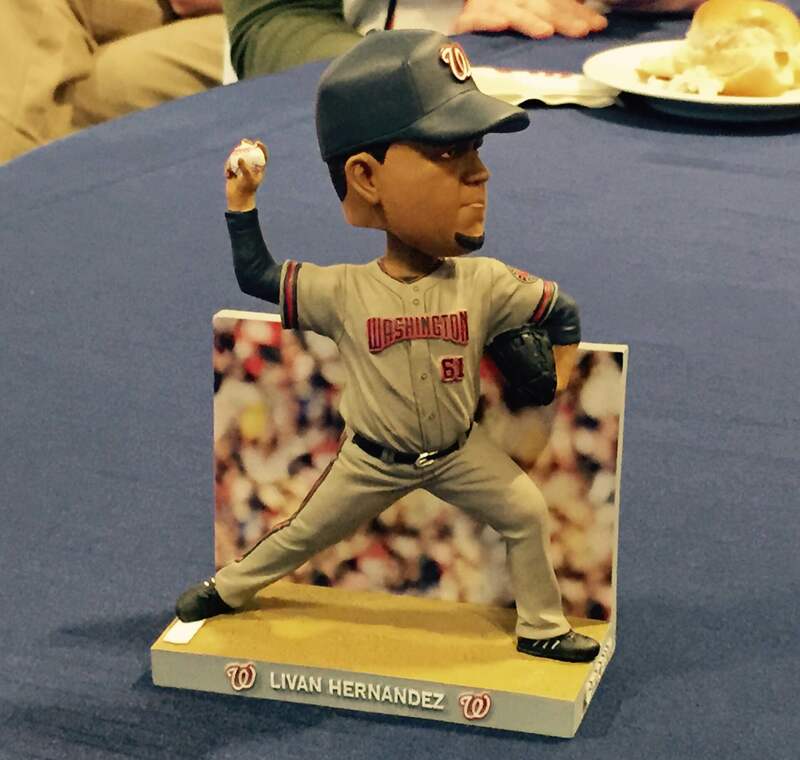 Honored this year will be Jordan Zimmermann, Denard Span, Wilson Ramos, Bryce Harper, Ian Desmond, racing president William Howard Taft, and Tyler Clippard (decided by fan vote over Adam LaRoche and manager Matt Williams). This will be the second bobblehead day for both Harper and Desmond. The NatsLive free postgame concert series returns with three dates, down from four last season. Bands are to be announced. Other giveaways include a Jayson Werth garden gnome, plus caps, t-shirts, an eco-friendly shopping bag, kids socks, a bottle cup (for adults only), a travel blanket, and a stocking cap on the final day of the season. The popular Pups in the Park promotion, in which a section is reserved for canine guests, returns to Nationals Park for four dates throughout the season. 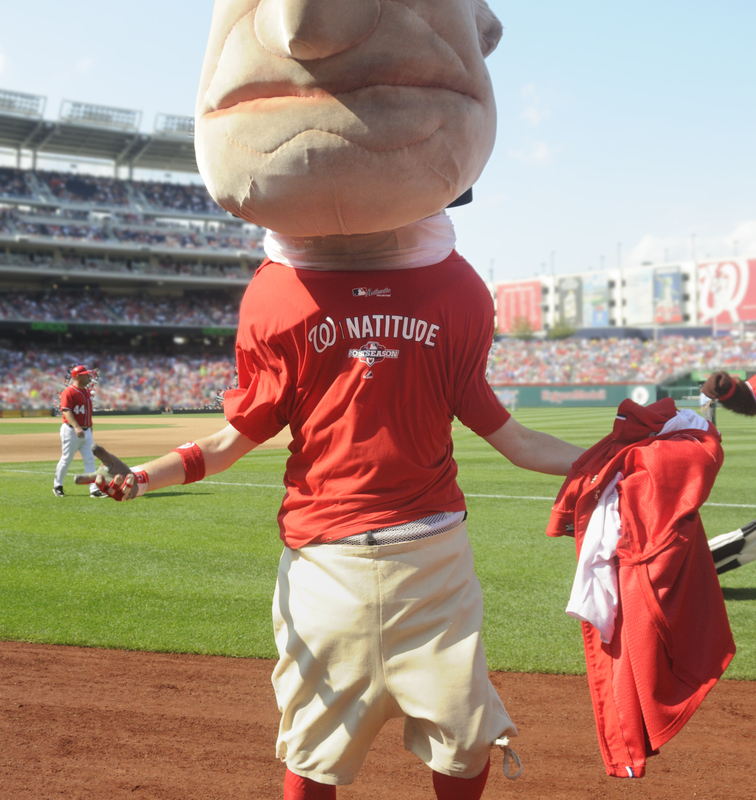 Abe Lincoln needs to get hot to have any chance of catching George Washington for the 2013 presidents race title. It may seem a daunting task, but unlike the Nationals themeselves, Abe’s fate is completely in his own control. On Saturday night, he looked like he had what it takes, fending off a surging Teddy Roosevelt to move within 6 wins of Washington in the standings. Lincoln then fashioned a balloon puppy at the finish line, honoring all of the canines in the stands Saturday for “Pups in the Park” night. A sold out Nationals Park crowd had much to celebrate Saturday afternoon, from Pups in the Park day, to a post-game concert by Dierks Bentley, to a stellar league-leading 20th victory for pitcher Gio Gonzalez. 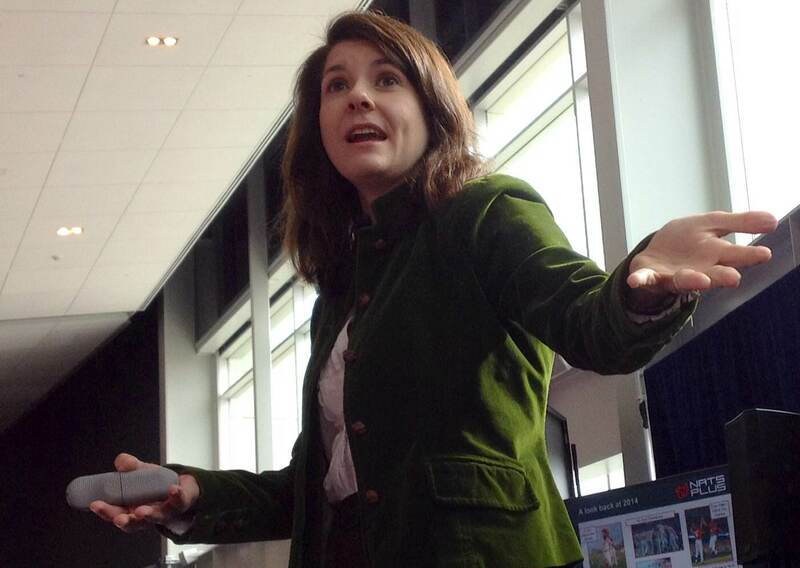 Those expecting a Teddy Roosevelt win unfortunately had less to celebrate. 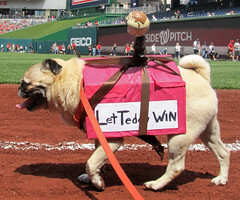 The movement has spread to the canine community, as evidenced by dogs now showing up in Let Teddy Win t-shirts; but despite looking good out of the gate for the second day in a row, Teddy was ambushed in the right field corner by his fellow commanders-in-chief. 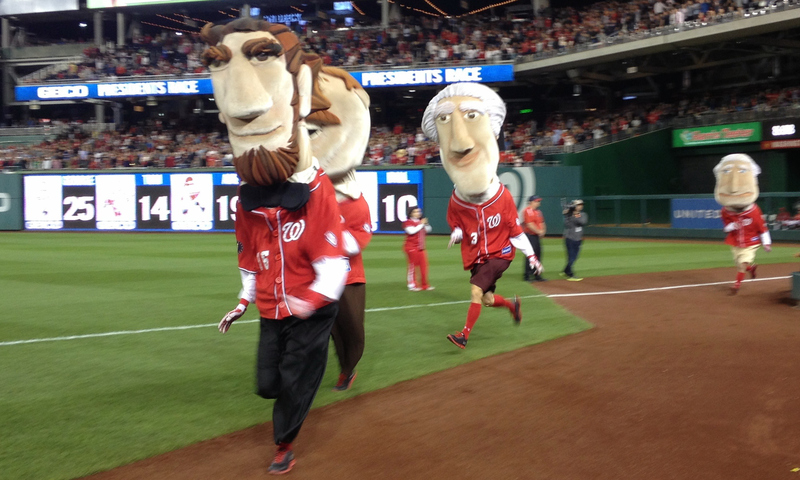 The hit by George Washington knocked Teddy out of the lead, and Abraham Lincoln pulled away for the win. If the 2012 elections were held today, Teddy Roosevelt has an early “leg up” on the canine vote. Adams Morgan pug Cachucha brought her owner Johanna Diaz to Nationals Park for Saturday’s “Pups in the Park” day, decked out to support her favorite racing president, Teddy Roosevelt. Cachucha took the pre-game parade seriously, sporting an elaborate “float” that included a Teddy Roosevelt bobblehead doll mounted on her back. “She was really hoping her float would give him an edge for a win,” said Diaz. Sadly, the pups simply proved to be a distraction for Roosevelt, but Cachucha got a consolation prize: She was featured on the HD scoreboard and voted fan of the game by the Nationals Park crowd. With three more Pups in the Park promotions scheduled for this summer, perhaps Cachucha can start a whole canine cheering section for our favorite president. 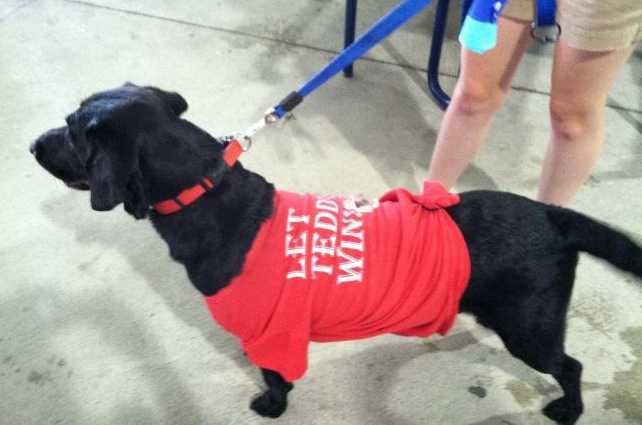 …and if a float isn’t your dog’s thing, there’s always the Let Teddy Win T-Shirt for dogs (above).